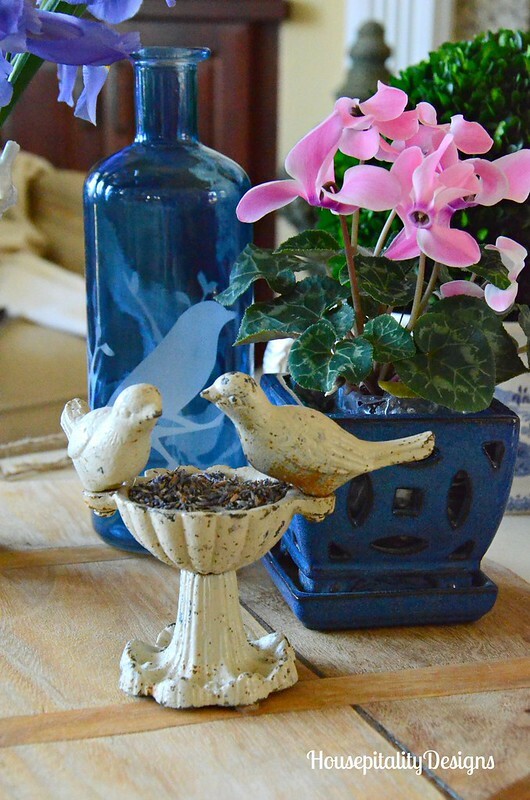 and some birds on the table for that touch of Spring. I need to buy more and place them in more rooms. They are a bargain at $3.99 a bunch. 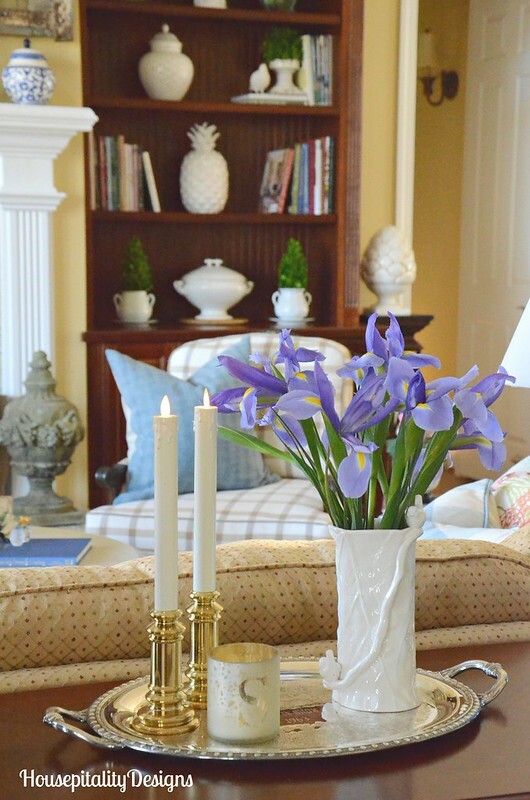 so irises went in the other vase and placed on the sofa table. 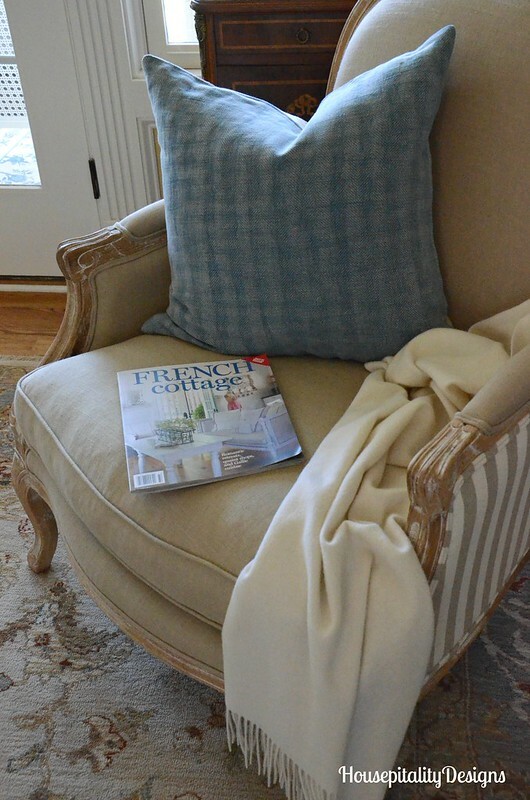 during their sale and purchased a pair of the new Herringbone design pillows. as it coordinates perfectly with the grain sack cushion. 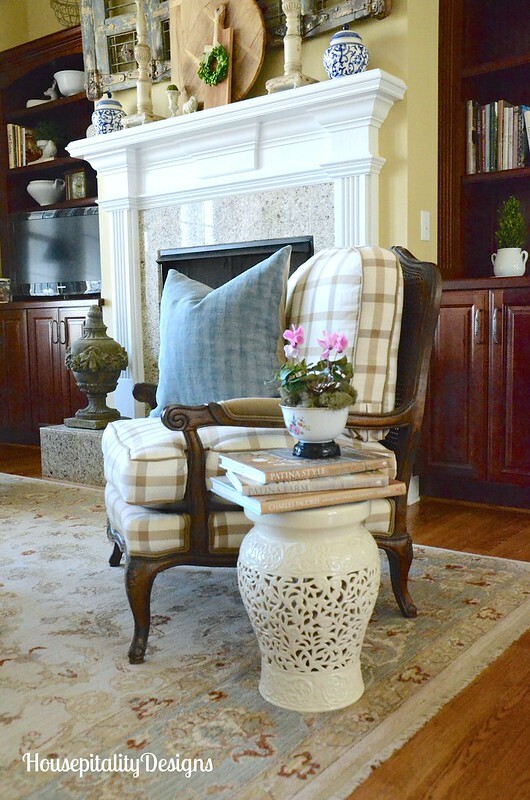 with the light blue and cream checked pillows. 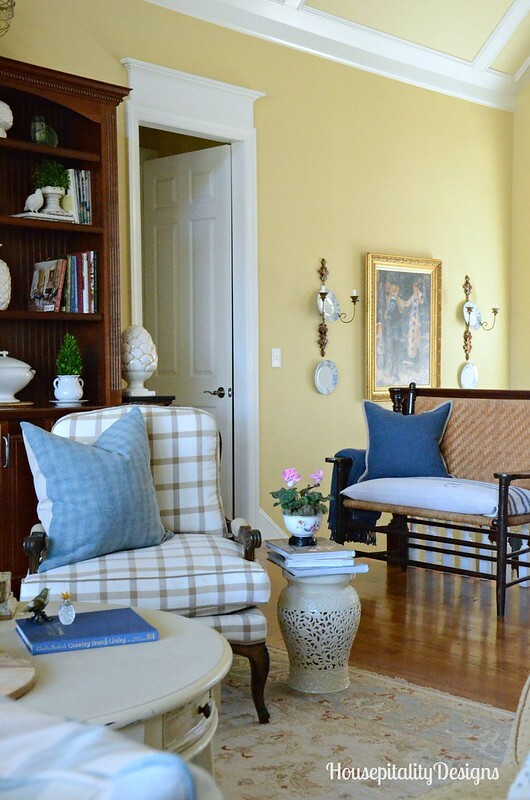 were a great compliment to the blue and cream checked pillows. and removed the magnolia wreath. certainly helped create a refreshed look for Spring. just by replacing the flowers. Flowering plants are certainly a great way to have those pretty blooms longer. 87 magazines (some very old Romantic Homes) and 10 old calendars. I have 3 more boxes of magazine to go through!!! year we moved into our house, which was also my granddaughter’s birth year. Yes, we closed on our new home the day that my sweetie was born! 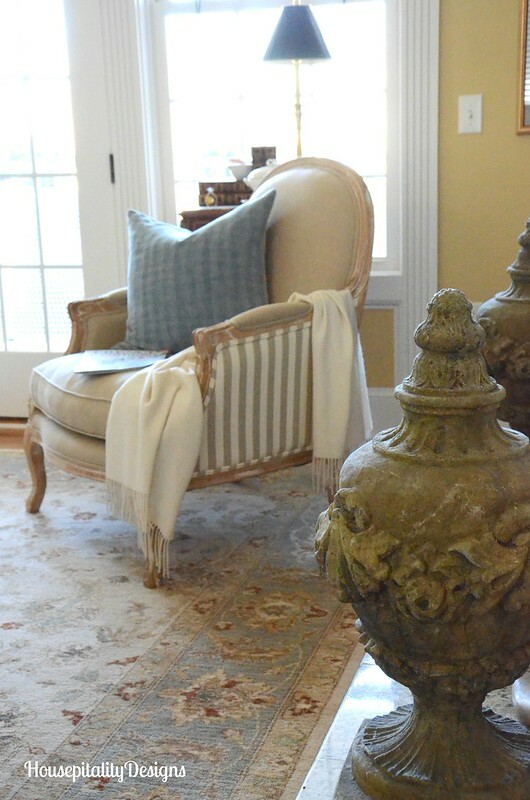 I am working on more rooms in the house for their Spring Refresh. I wish you a most beautiful day and hope it includes enjoying some Spring blooms! Love the light touches of your spring refresh, Shirley. Those irises are gorgeous! Makes me wish for May, when mine will bloom. Good job on the purge. I have been diligently purging since January, and really want to continue through the year. It gets exhausting, so breaks on Sundays are what I’m trying to allow myself, so I won’t lose steam. I’m giving up purchasing for myself and home for Lent, other than what’s necessary for our bath renovation and kitchen update (most of which was ordered prior). Have a great week. Rita C at Panoply’s recent post…Traveling Totes Adventures – Winter Hibernation, and a Giveaway! Beautiful spring touches and it makes me want to run out and purchase some flowers which I intend to do soon. Shirley, your spring refresh is beautiful, as always! 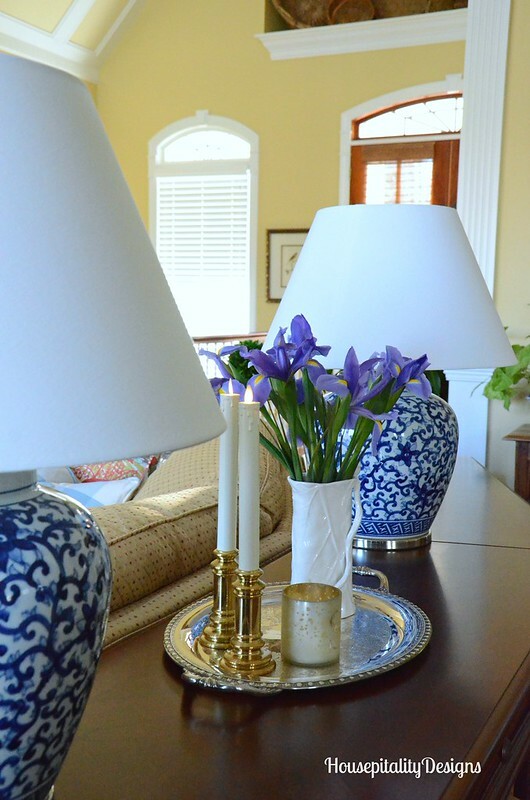 The irises along with your blue touches add so much cheer. You are doing great with your purge. I save way too many magazines! Happy Monday! 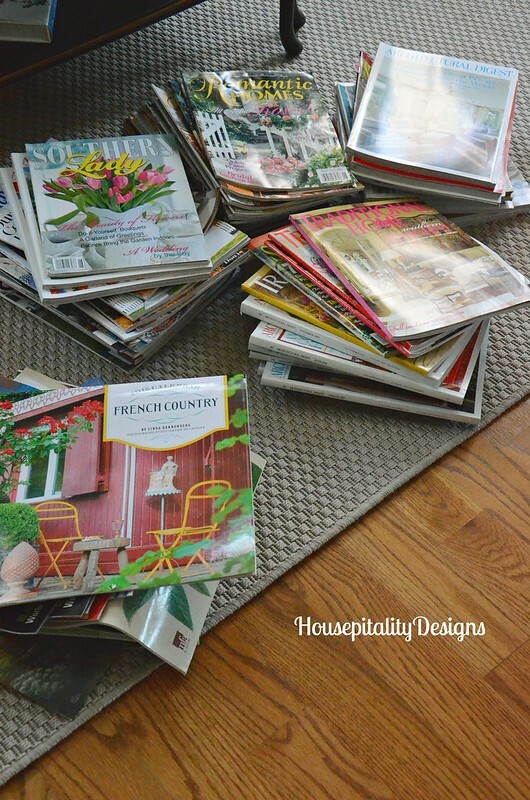 Beautiful ways of bringing spring into your lovely home, I have so many decor magazine, how did you sort, keep, go through etc to determine which ones to recycle. If I just got rid of 25 things in a day, it would help. Oh it looks so fresh and colourful! Lovely… we’re expecting another 10 inches of snow this week. Sigh….. 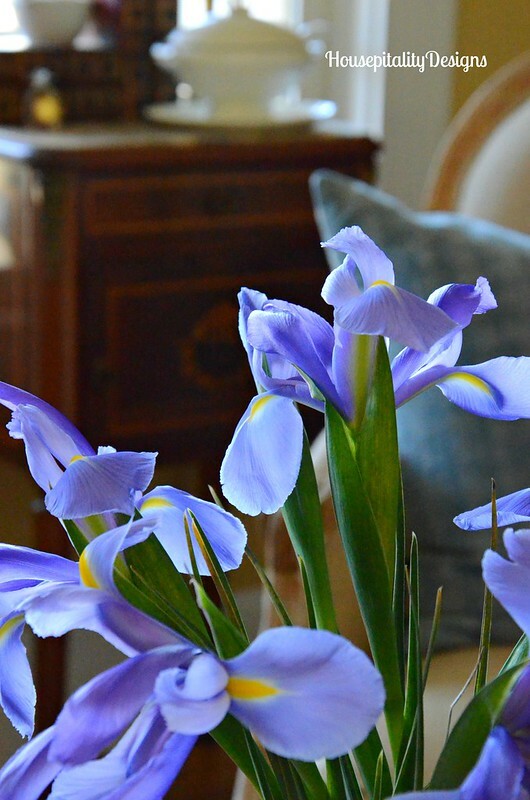 The blue irises are beautiful and do bring such cheer. 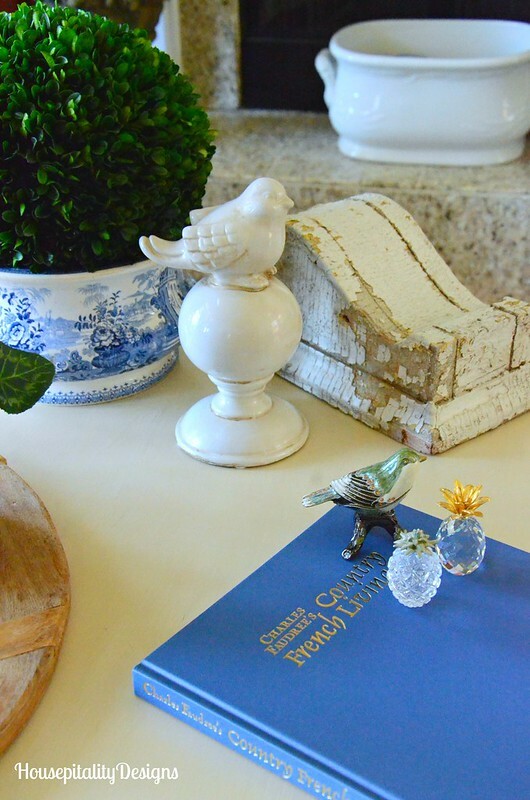 You are inspiring me to get off this computer and create some vignettes to refresh my house as well as throw more magazines away. I actually asked my nail salon if they wanted some magazines( certainly noticed they needed some). I also took some to my doctor’s office. My car is full of stuff to take to the Mission. Enjoyed your decorating as usual this morning, Shirley. Good morning. 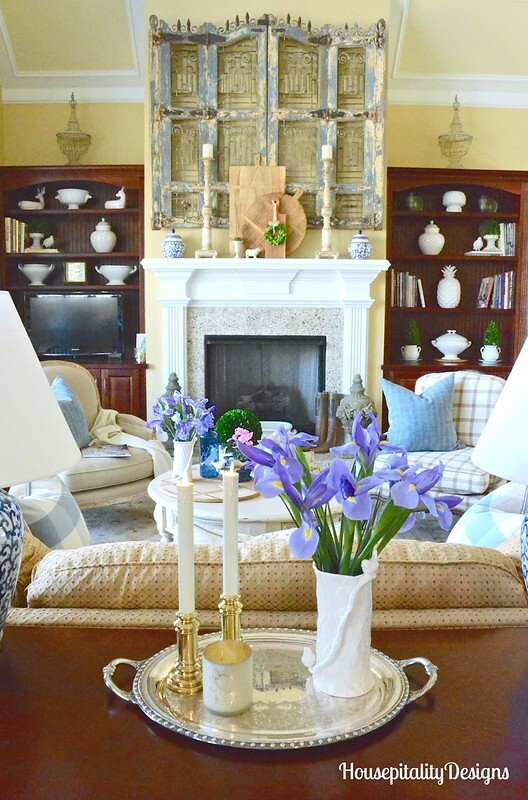 I love the light blue in here and the irises are gorgeous. I JUST threw out my cyclamen, I just can not keep them alive:( I have flowers on my list of things to get today. Off to get my nails done then some errands. It is cold again here:( I wish the high 60’s and 70’s would return:) Have a great day! Pinky’s recent post…Another Great Find! The room looks so lovely. Flowers always brighten up a room. Shirley, your Spring touches look beautiful. 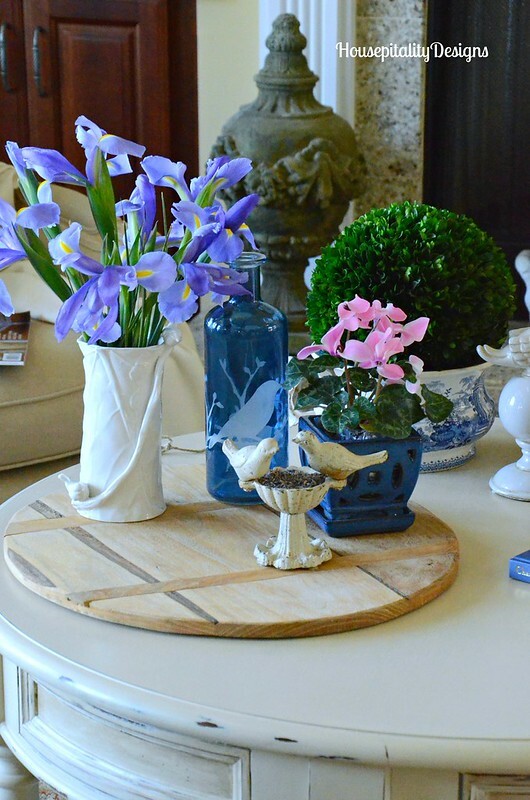 I love all of the blue accents, and those irises are gorgeous. 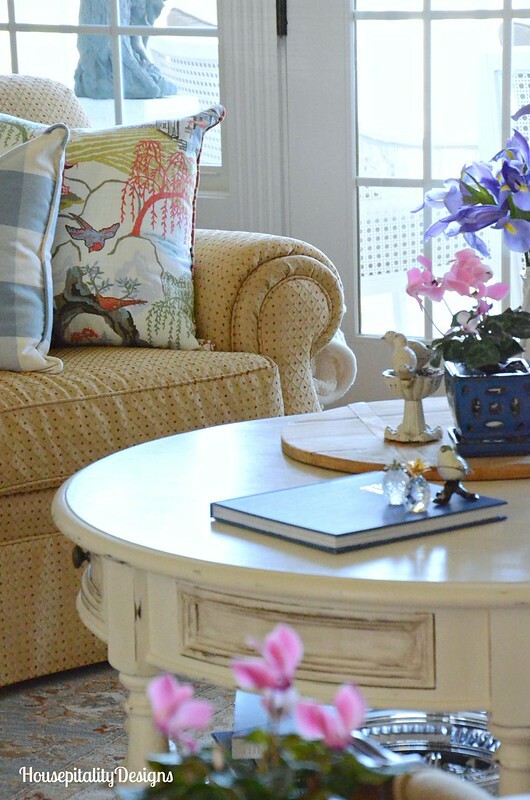 It has been unseasonably warm here too which has me adding my Spring decor too. I hope that your enjoy your day! Happy Monday!!! What a great omen to have of your grand daughters birth and home closing! Everything looks beautiful Shirley! Oh Shirley…love it all. I wish I lived near you I would love to see your home in person. Shirley everything looks so fresh and SPRINGY!! 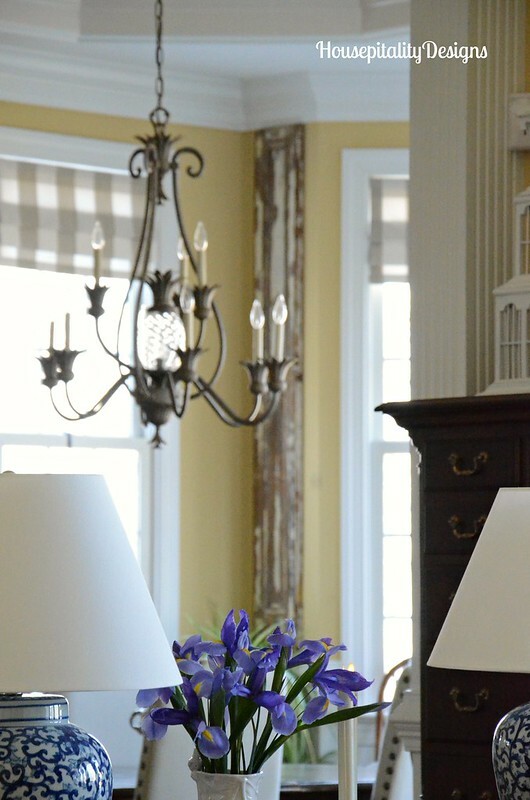 Love the blue iris, the perfect flower for your room!! Happy Spring!! 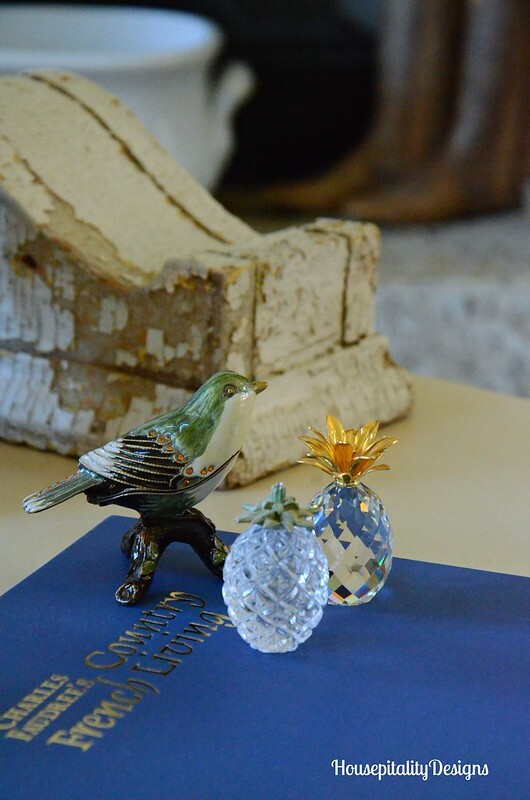 KATHYSUE’s recent post…What Should You Put On Your Coffee Table? Whatever changes you make, they always are perfect for the space. Spending so much time at home these weeks has made me think about some changes starting with changing the carpet and one of the wall colors in the bedroom! Absolutely gorgeous! Your great room always looks beautiful, but those blues really seem to bring all the other colors to their best possible selves. 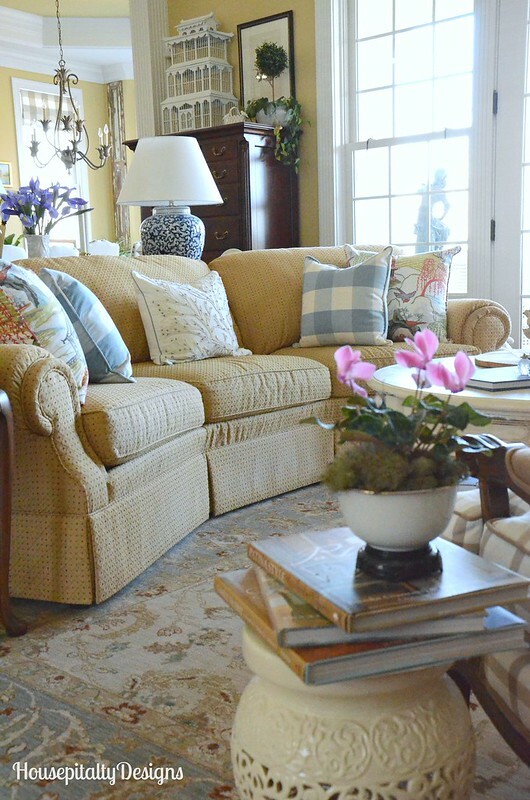 Oh, how I would love to sit on your couch, and see all the beauty you create, Shirley! Spring…we are ready! Beautiful room. Every arrangement is so well put together. I really enjoyed the tour! It is lovely. I am especially fond of the color of the walls. And, I am a blue lover so, of course, I love the blue. Charles Faudree would approve! exquisite, Shirley. The fresh flowers in there just liven up everything. Just beautiful. Love the shade of blue, even the book color is gorgeous! Seems like you are ready for Spring. You have an amazing home. 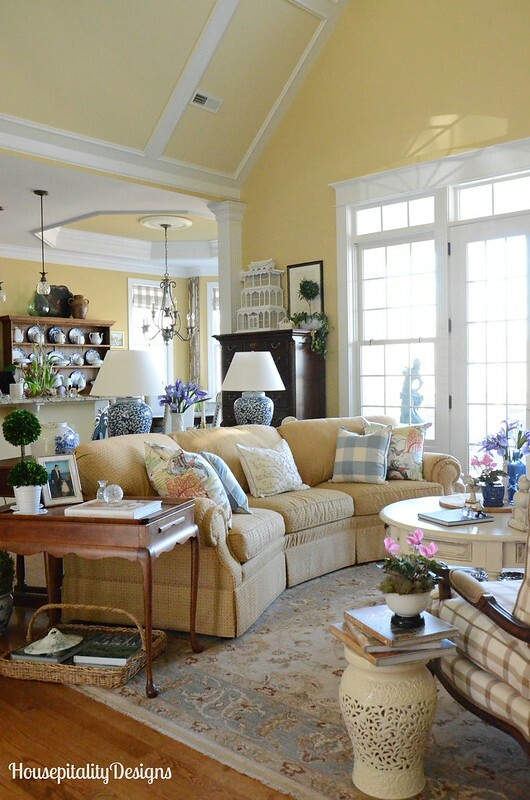 Pretty spring room! I am amazed at your challenge and how well you are doing. Everything is beautiful, Shirley! 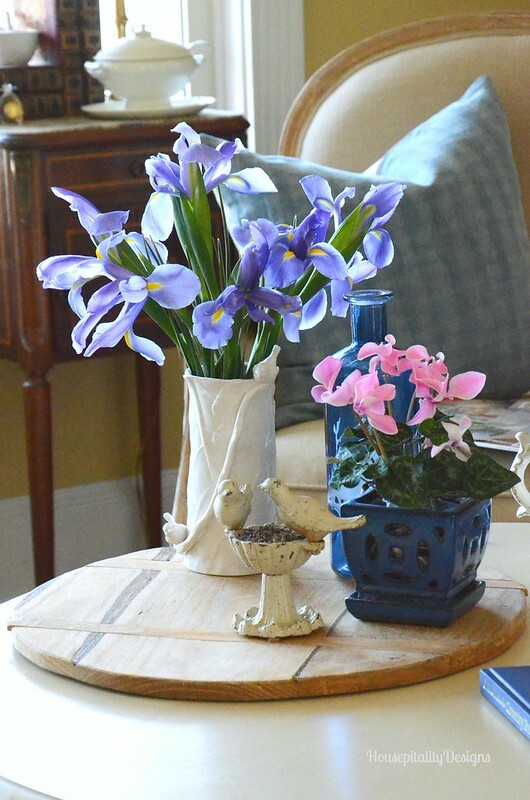 I especially love the birds on a limb vase with the irises! Hi Shirley: I just love this room! Blue is my favorite color and you have used it so nicely. A question: what is the color of paint on the walls? It is such a light, fresh color! You can never go wrong with blue! Everything always looks so pretty with your flowers. I’m happy to see I am not the only one who keeps all the decorating magazines. It’s finally sunny here too…and we are having fun…and today I will decorate! Your springtime room is lovely. I’va also been looking at blue in a new light lately and incorporating it into my springtime decor. The flowers add gorgeous touch…. Shirley, would you be so kind as to share the yellow paint color? My mom has about twenty shades of yellow on her walls and they all look horrible!!! She loves what you have in your home! Thank you Shirley!